What are your thoughts on wholewheat pasta? Same rules apply? (apart from colour, obviously!). do Italians even eat wholewheat pasta?! Thanks for the question, Becky. The short answer is: yes, the same rules apply, apart from the fact that wholewheat has a darker colour. Regarding what we Italians do, I think the answer is worthy a short note. First, whole wheat pasta is not a tradition, rather an invention of marketing, and quite a recent one. A whole wheat pasta recipe that has “not italian” written all over it. Second, the selling proposition of whoewheat pasta is that it should be healthier and less caloric, which is why you will find it in the “diet” section. Less caloric? This is plain nonsense. You want to diet, you quit pasta altogether. Why? I was at the supermarket today, and I’m a product info geek. 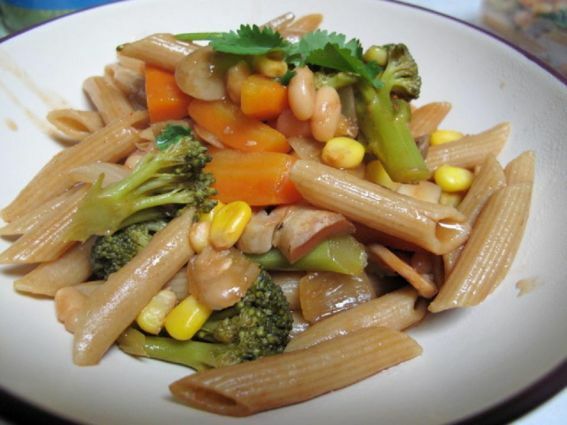 A whole wheat pasta has 356 Kcal per 100g (dry weight). A normal pasta has 360 Kcal per 100g (dry weight). Whole wheat is about 1% less caloric than traditional pasta. Fat chance. So, unless you eat a chilo (dry weight) or so of pasta per day, each day, the difference in caloric intake is less than one rigatone per day. Frankly, not worth the bother; plus, if you eat that much pasta you have more serious problems than eating one less rigatone per day. As for improved healthiness, don’t even mention that. Whole wheat is richer in fibers. But fibers belong in pasta as they do in buttermilk. We’ll take my fibers with my veggies and my fruit, thank you very much. Whole wheat has also about 1% more protein. And also about 1% more ashes. I do not think anybody outside marketing can claim a 1% difference as significant. Now, let’s get to the core issue: the only reason worth making distinctions in food. To most Italians (with the exception of diet-food fans), whole wheat pasta tastes worse and has a spongier feel and a sawdust-like texture that does not add to the value of the dish. As always, it’s a matter of taste. I was so happy to read your notes on whole wheat pasta. I don’t care for it and now I don’t have to feel like I SHOULD be eating it for the health benefits. To be honest I think that to understand more about pasta the best thing to try making it yourself, this way you can feel with your hands how the ingredients behave, how the taste and texture change, how it responds to cooking. Egg pasta is far easier to make than many people think, and it’s fun! Spot on, Editor. I am a great fan of rediscovering food as a physical and social activity. In a book I read, set in rural southern Italy, a son comes home and announces he’ll be movign to the big city. The mother comments: “poor son, you’ll have to live on bought bread”. We are ofter so far removed from our physicality that I sometimes need to explain the mother implied the son was raised on home-baked bread. you raise good points! It NEVER tastes as good as traditional pasta. So true. That weird texture doesn’t go well with anything and those infinitesimal health benefits are just not worth it..
Well said. I totally agree that substitutions shouldn’t come at the cost of the things we love most about foods or dishes. Julia Child’s relationship with butter is a great example. She wasn’t going to substitute or cut back in the dish — but she wouldn’t eat like that every day. All to say — you’re in good company. Thanks for the reminder. I confess I had to google Julia Child. You (and her) are right. There’s no “forbidden” food. It’s all a matter of being adult with oneself and recognising not all meals can be a kid’s party meal (like, pizza, fudge, chips, and ice cream). I agree that wholewheat pasta isn’t great at all – it seems to hijack the other flavours. I now eat spelt pasta (I can’t eat wheat) which is far far more delicate in flavour than wholewheat pasta and also a better texture (even if you slightly overcook it it stays ‘al dente’). you’ll be glad to know that the Marche are great spelt producers. I use it mostly in the summertime, as a substitute for rice in salads. I’m delighted to discover that wholewheat isn’t worth eating! Another interesting pasta post, thanks Walter.